This important component of the building is decorated with works by Antonio Zanchi, Pietro Negri and Giovanni Antonio Fuminani. 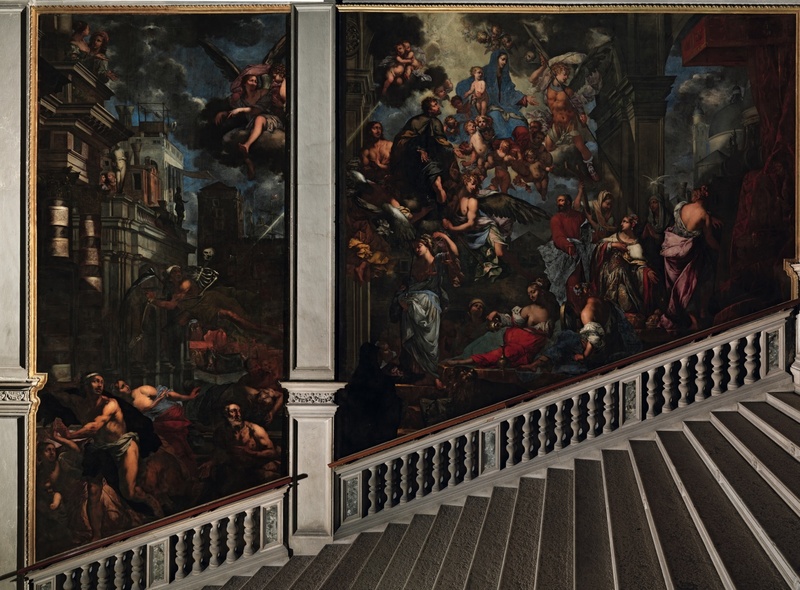 The Virgin appearing to the Plague Victims, which occupies the whole right-hand wall (as you ascend) stands as one of the great clinching elements of the staircase’s pictorial decoration, concluded only in the second half of the seventeenth century. Completed in 1666, as a ‘reminder’ of the terrible 1630 plague, it is considered a masterpiece from the hand of Antonio Zanchi, one of the major exponents of the ‘tenebroso’ school. It is composed in fact of two enormous canvases separated by a pilaster, which the painter brilliantly incorporates into the composition, depicting with a dramatic interplay of light and shade, and a marked naturalistic rendering of anatomy, the terrible situation of the town, with the Virgin and San Roch interceding before Christ for its salvation. 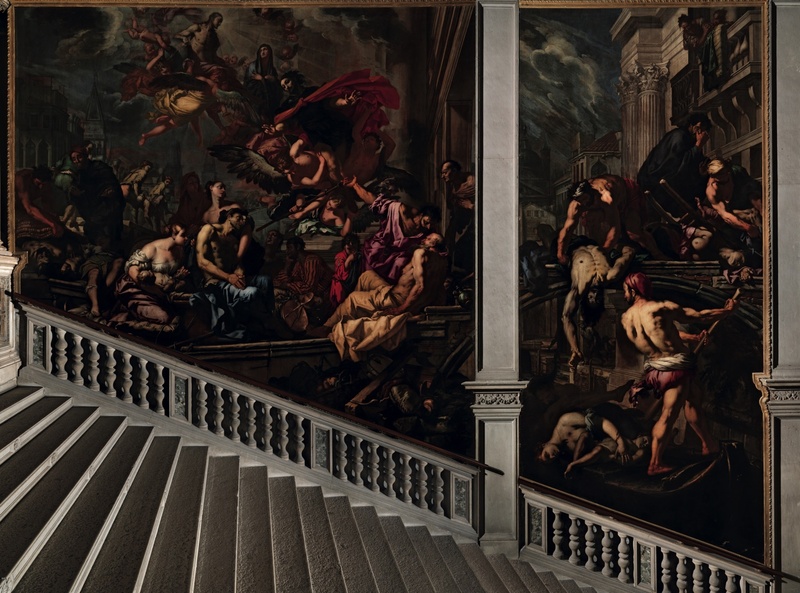 On the opposite wall of the staircase, a few years after Zanchi’s tour-de-force, in 1673, Pietro Negri illustrated a similar theme, in what is rightly thought to be his masterpiece: The Madonna saving Venice from the plague. The miraculous apparition of the Virgin takes place against an imagined architectural background, in which the only real element is supplied by the Basilica of La Salute, begun in 1631 as an ex voto for the release of the town from the terrible pestilence which had afflicted it, and whose building had not yet been wholly completed at the date of this picture. Both are works of great narrative force. 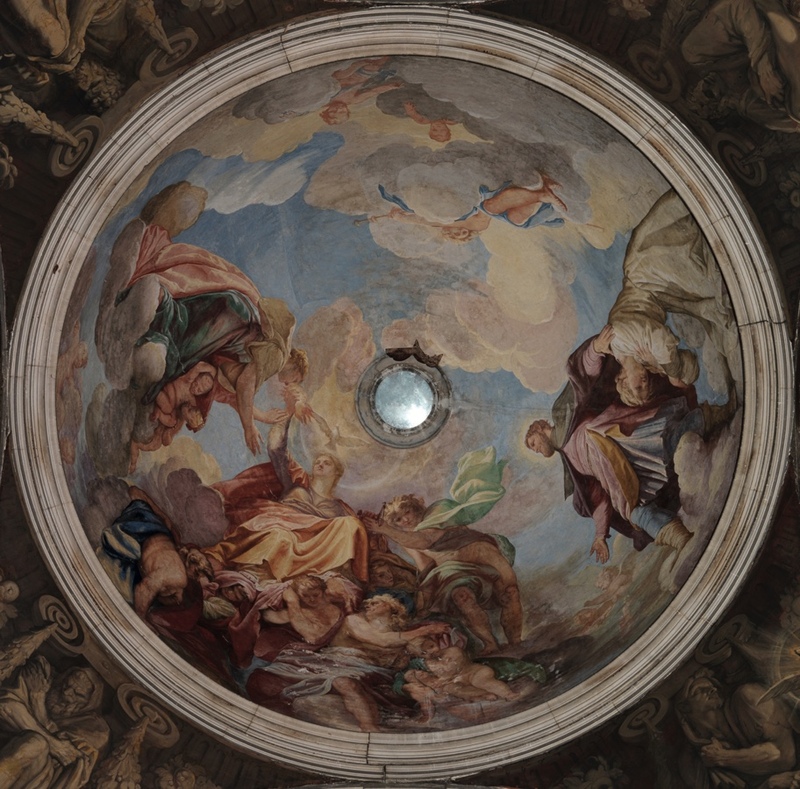 The fresco decorating the small cupola at the top of the Grand Staircase, notable for its pronounced exercise in foreshortening to meet the perspective of someone mounting the stairs, illustrates Charity holding the flaming torch of Religion before the impoverished sick presented by St. Roch. Previously thought to be the work of Girolamo Pellegrini, it is now attributed to Giovanni Antonio Fiumiani. Generally attributed to the same hand are the two canvas lunettes with Allegories of Science, History, Wealth and Peace, placed above the lateral arches and the monochrome muscular atlantes in the pendentives.